The second Touken Ranbu illustration book is here! Touken Ranbu-ONLINE- couldn't be contained to a PC browser game or smart phone application alone - it went on to inspire musicals, stage productions, and other forms of mixed media, in addition to receiving two animated adaptations, with season 2 "Katsugeki Touken Ranbu" airing in July 2017. To commemorate the 2 years since our servers went online, the original Touken Ranbu character designers have provided all-new original illustrations, which we've collected in our "Touken Ranbu 2nd Year Anniversary Commemorative Album," coming out in summer 2017! In addition to the illustrations created for the first ever official collaboration event "Touken Ranbu - Honmaruhaku" which opened in January 2017, it also features artwork you won't find anywhere else. Like the "Touken Ranbu Kenran Zuroku" and "Touken Ranbu 2nd Year Anniversary Commemorative Album," it's an essential for all true Saniwa. 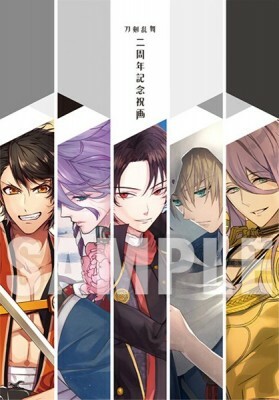 ・This is for the "Touken Ranbu 2nd Year Anniversary Commemorative Album" only, which was part of the "Touken Ranbu: Summer 2017 Comiket Set." The "Summer 2017 Touken Ranbu-ONLINE- Original Illustration 6-Piece File-Folder Set" will not be available for individual sale. First available at Comic Market 92 in the "Touken Ranbu: Summer 2017 Comiket Set."